Watch out! There are active swooping magpies in Warwick. INFO NEEDED: Where are our magpie hotspots? SPRING is only a few weeks away and this means Australia's number one pest will return to rain terror on unsuspecting cyclists, toddlers and early morning joggers. 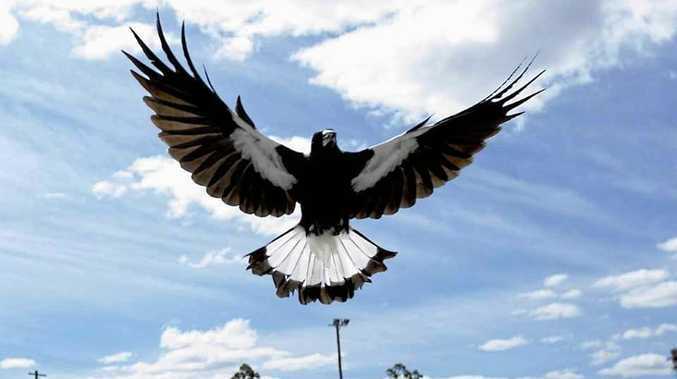 We're talking about magpies and in a bid to keep the good people of the Southern Downs safe, the Warwick Daily News is putting together a comprehensive map of known swooping hotspots. Studies by the Queensland Department of Environment and Science suggest only 9 per cent of magpies engage in swooping behaviour. By understanding magpies and knowing how to behave around them, you can also avoid their attacks. - Wear a broad-brimmed hat and sunglasses or shelter under an umbrella to protect your face from swooping magpies. - If a magpie swoops while you are cycling, it will probably stop swooping if you get off your bike and walk. - If you must enter a 'defence zone', magpies will be less likely to swoop if they are watched constantly, or if people walk in a close group. - Use signs to warn others of the location of nests and defence zones, particularly in areas used by children and the elderly. - Waving sticks or umbrellas in the air or attaching a brightly coloured flag on a long pole to your bicycle can stop magpies from swooping. - The best way to stay safe is to avoid their nests. If you see a swooping occur, or know where the magpie nests are, email the location to edit@warwickdailynews.com.au or call us on 4660 1325. Video and photos are welcome to, but stay safe.